I know, having fresh produce on hand can be a challenge in some places! Time can be a factor too. I confess to having those days when you just don’t want to leave the house, the cupboards are barren and dinner is looming. I am happy to say, this was not one of those days! Today was a shopping day. Today I hit it big with discounted produce. I always check those shelves in the back where they put the “old” fruits and vegetables. Some days are better than others. Today I came home with grapes (a couple of crushed ones on the bunch, but nearly a pound of perfectly good ones), sweet potatoes (come on! How bad can they be? ), sweet onions, heirloom tomatoes, pears, apples, and 2 mangoes for 39 cents! SCORE! I left behind: red peppers, white potatoes, green peppers, apples of many types and dates. Why pay full price all the time? You can build your menu around these treasures! My inspiration was the tomatoes. I combined them with the onions and things I had on hand. 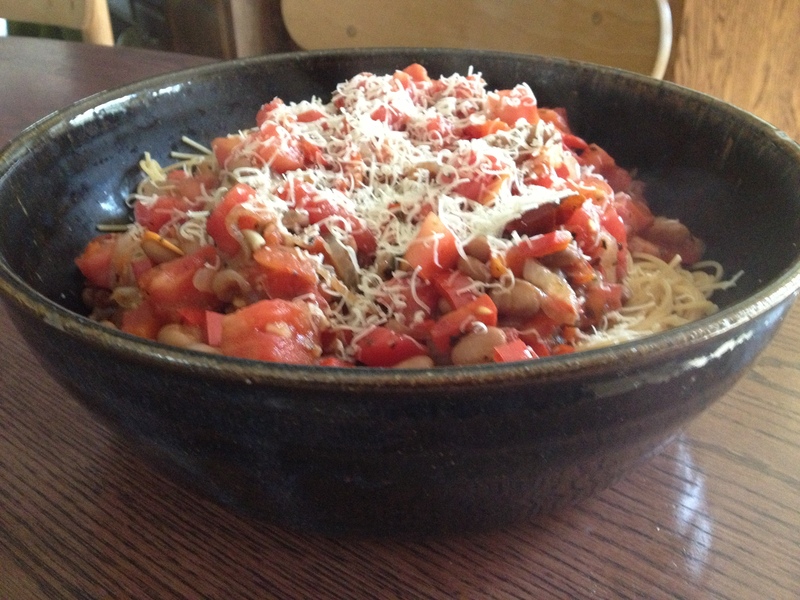 The resulting sauce was served over angel hair pasta with freshly grated Parmesan. Heat the olive oil at medium heat in large pan. Add onion and garlic. When these have softened, add basil, oregano and chili. Keep cooking until onion begins to brown, stirring often. Add beans and red pepper and when that begins to soften, add the tomato and splash of vinegar. Now, you only want to warm the tomato, not break it down! So be sure to have your pasta in the pot at this point. When the sauce is warm, turn the heat down until serving. Don’t let it boil!